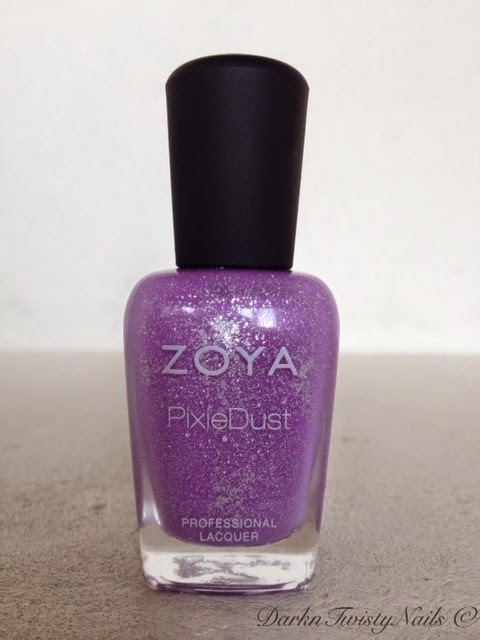 I think it's save to say that the Zoya Pixie Dusts are my favorite textured polishes. I love them so much because the texture is so fine, no big chunks and my hair doesn't get stuck on my nails if I run my fingers through it. This particular Pixie Dust has been standing in my stash for a while, not unloved mind you, but I just felt it was more appropriate for Spring and some nice weather. Since Spring is definitely here, I decided it was time to try it. Zoya Stevie is a lilac base with tiny silver shimmer. Since it's a Pixie Dust, it dries to a textured finish. The formual is really nice, on the first coat you think it's never going to be opaque, but somehow the second coat covers so well, you don't need the third. The dry time is a bit on the slow side, but once it's dry this baby doesn't move! I absolutely love it. I was afraid this might be a bit to... pastel... for me, but luckily it's not. It works rather well with my skin tone, it's the perfect spring texture. I've seen a lot of nail art with this polish and I can't wait to try some of the cool designs. Some people really don't like nail art with a texture, but I don't mind it. What do you think? Yay or Nay for textured nail art?